We started at 8 and immediately got caught by a long freight train. Anyone care to guess the number of cars? There were 25 of us waiting and we decided to all ride together to the First SAG. It was very cool but slower than I normally ride. 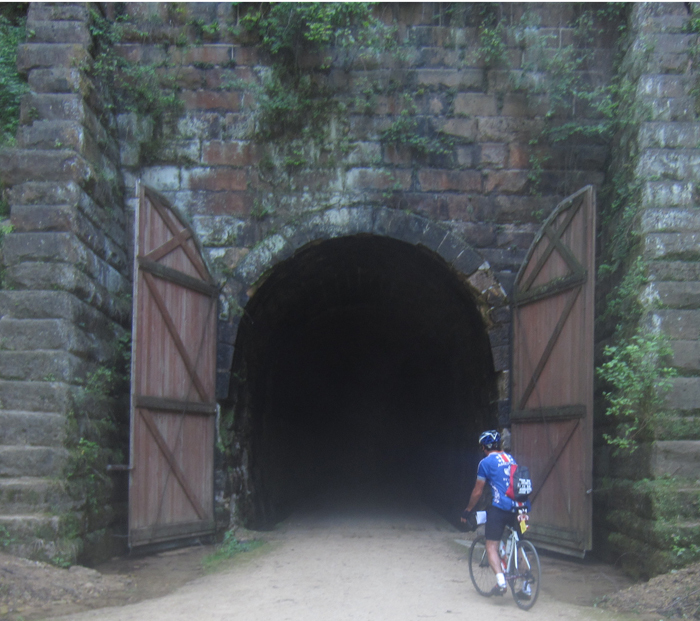 Then we rode 34 miles on the unpaved Sparta to Leroy rails to trails bike path. This included three tunnels where you had to walk with flashlights. This added another 40 minutes. Combine this with the fatigue of riding 466 miles in the last five days (93 per day) and you have a group of tired riders. Even Sebastion admitted he was tired last night. I got into the hotel today at 2:30, the latest yet. Sebastion and Tom were slow through the tunnels, I was ahead, and they proceeded to get lost today. The pleasure of bonus miles. A note on bike trails. I find them much more dangerous then riding on roads. Untrained riders, kids not paying attention, dogs not well controlled, ugh. Today I was riding with Ken and two teenagers were riding on both sides of the trail. 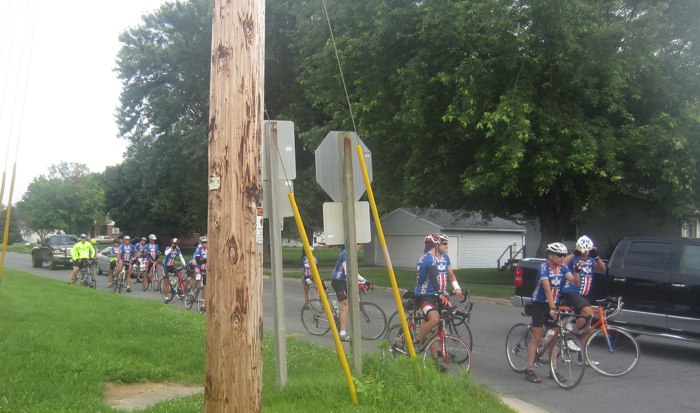 We were right in front of them coming in the opposite direction and we had to yell at them to avoid a collision. They simply were paying no attention at all as to what was in front of them. I may have fallen off the dessert wagon, but I am nothing compared to Ed, a rider who grew up in Dexter. Last night at another awful buffet there was a self serve scoop your own ice cream bar with all the fixings. I may of filled a bowl, but not Ed. He got a dinner plate, filled it with ice cream, piled on as many candies as it would hold and returned to our table. When I pointed out there was chocolate sauce he went back and put on enough sauce to fill a tanker. I left while he was eating it. When I asked him how it was this morning he told me it was so good that he went back for a second helping. Sparta, Wisconsin claims it is the bicycle capital of the world. I have no idea why. In 1946 a Milwaukee native named Mel Flath brought the first amphibious truck (DUKW) to the Wisconsin Dells. It was an impulse buy that he had made at a government auction in California; the trip's purpose had been to purchase war surplus trucks. Mel opened the "Dells Amphibian Line", which gave 90-minute tours in the Wisconsin River, exposing tourists to the area's famous sandstone formations. Waiting for the train. We all then rode to the first SAG together. We are in Wisconsin. 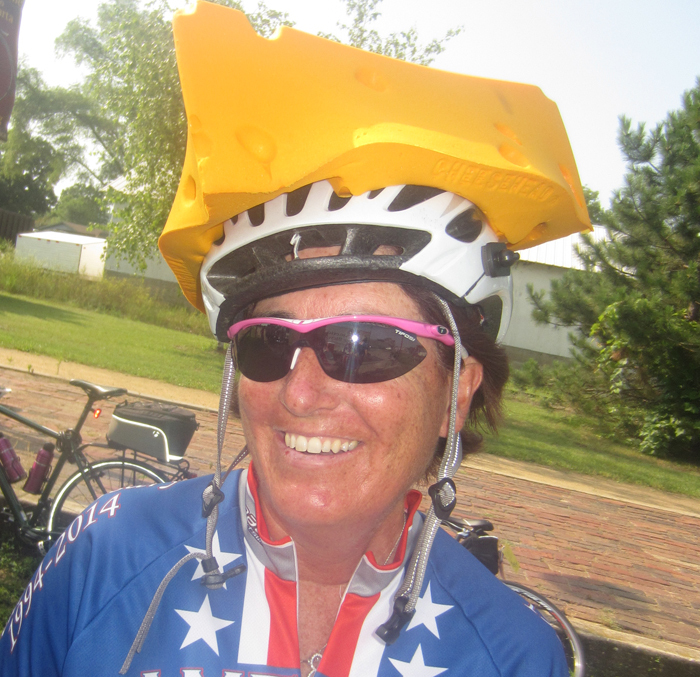 Land of the cheese heads. It was mandatory to walk in these tunnels. I have no idea why Sparta promotes itself as the bicycle capital of America.